Although it feels like I just got back from Mexico last week (okay, it was a week ago tomorrow), I really did just get back from Philadelphia earlier today. I had a bit of a travel whirlwind between being on vacation in Mexico for a week and then having to fly out to Philly for a work trip two days after getting back, but I’d never been to Philly before, so I was looking forward to seeing it! Luckily, my great friend Jason, who was born and raised there (who I know because I met him years ago at my favorite Doctor Who convention, Gallifrey One), said he was willing to play tour guide for me. Hurrah! I arrived in Philly around 1:45p on Sunday and caught a shuttle to my hotel (very near the airport, thankfully), where Jason met me. He had a great afternoon of walking around to see the sights planned for us, which was perfect given the awesome weather (close to 80°!). It was so cool to be with a friend who has so much knowledge about the city – the perfect tour guide! There’s a lot of stuff to see in Philly, but I had to settle for the edited highlights since we only had one afternoon to see them, which was fine by me. I think the story of our afternoon/evening is best told through my pictures, so here we go! 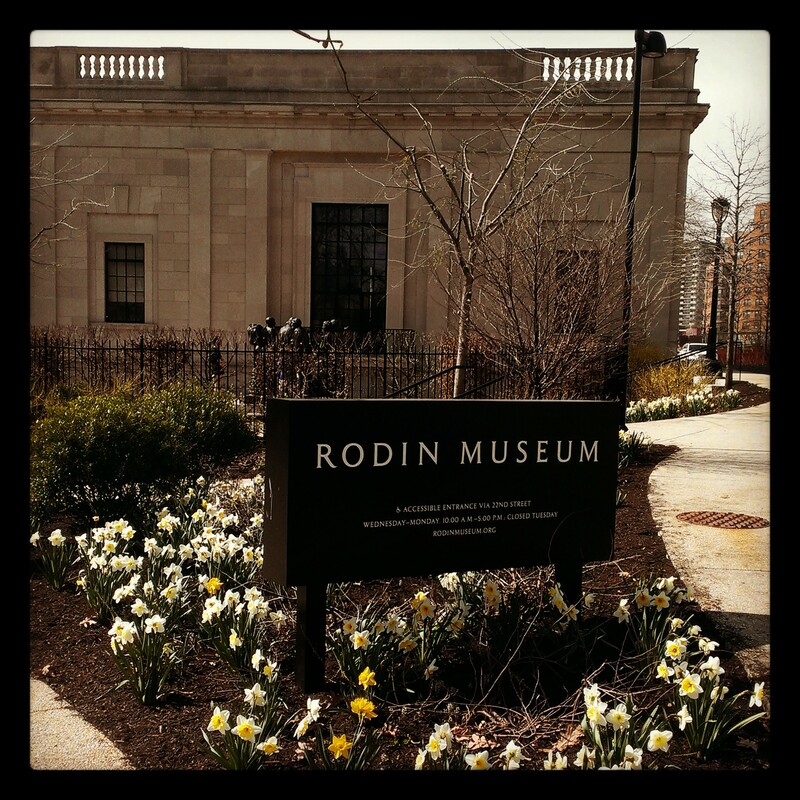 I loved the exterior of the Rodin Museum! Just a cool-looking building. 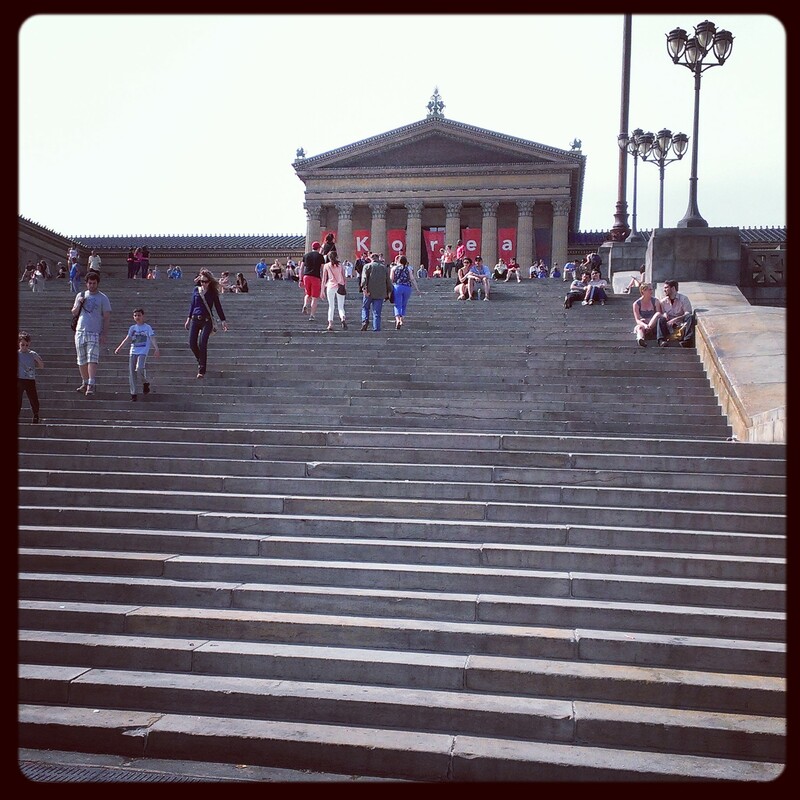 The famous Rocky Steps outside the Philadelphia Museum of Art. 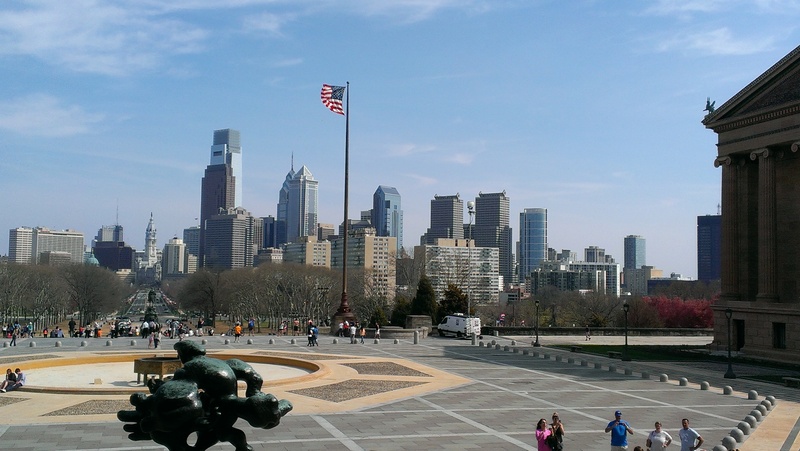 I also got a nice picture of the Philly skyline! 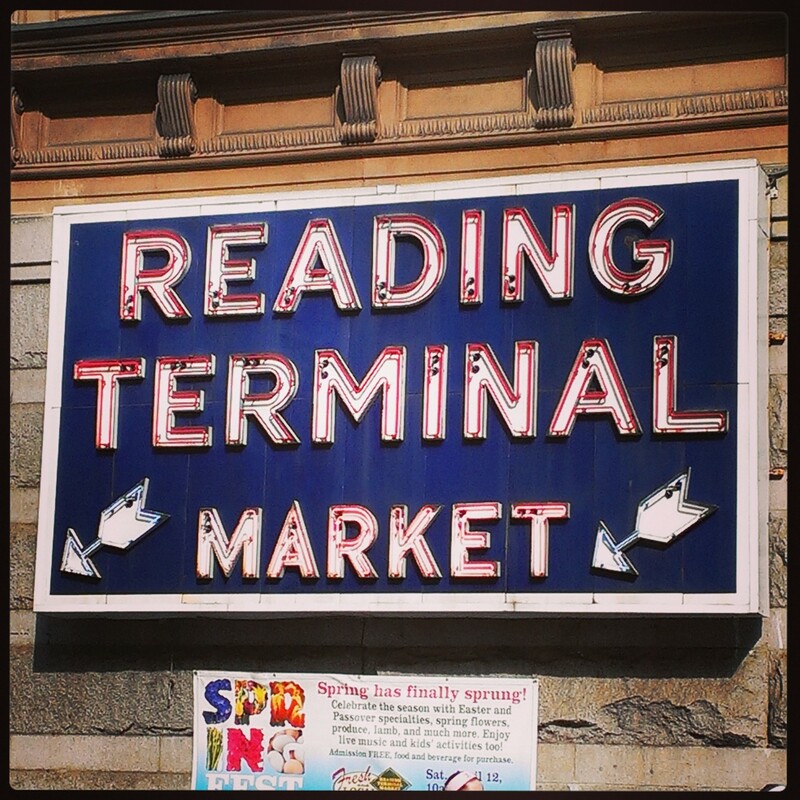 I’m glad we made it to Reading Terminal Market, but I’ll have to go back sometime when it’s not right before closing time on a Sunday afternoon. Not everything was open and there were a LOT of people there! 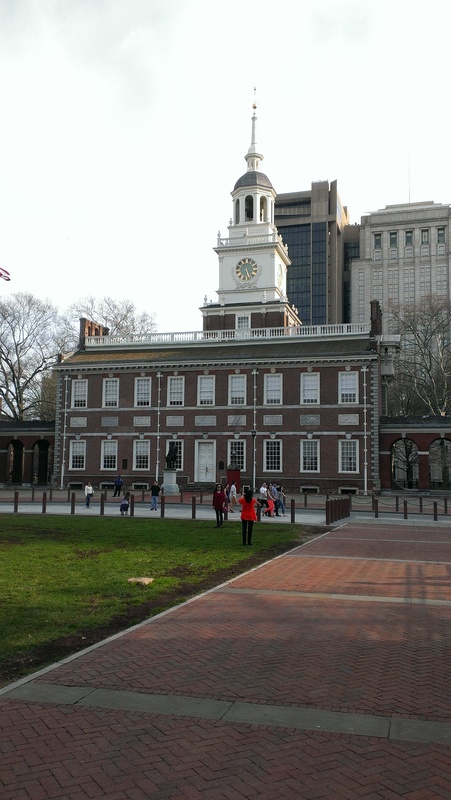 Independence Hall, which I learned is part of Independence National Historical Park. 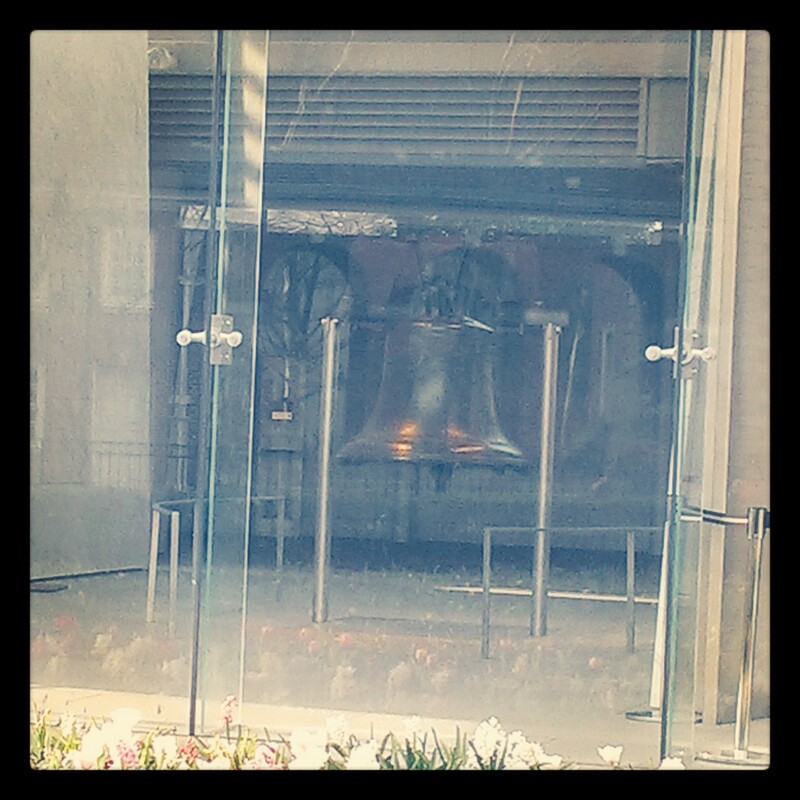 Look Ma, the Liberty Bell! I’ll be honest and tell you that it was a little underwhelming. A lot smaller than I imagined! 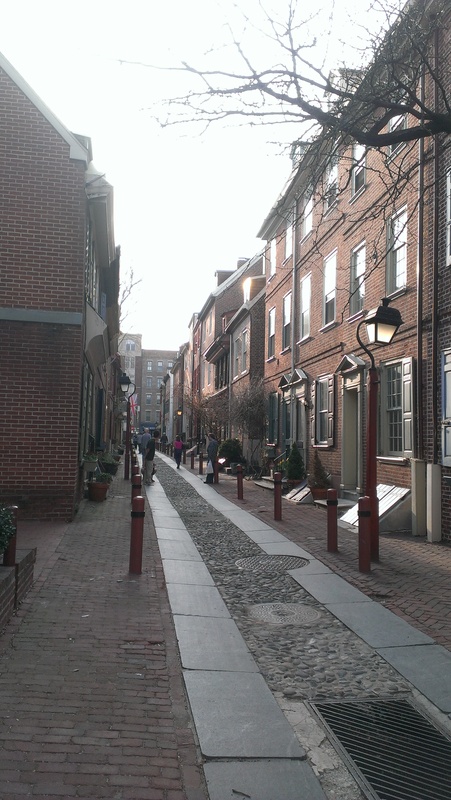 A nice shot of Elfreth’s Alley, which is generally referred to as the nation’s oldest residential street. 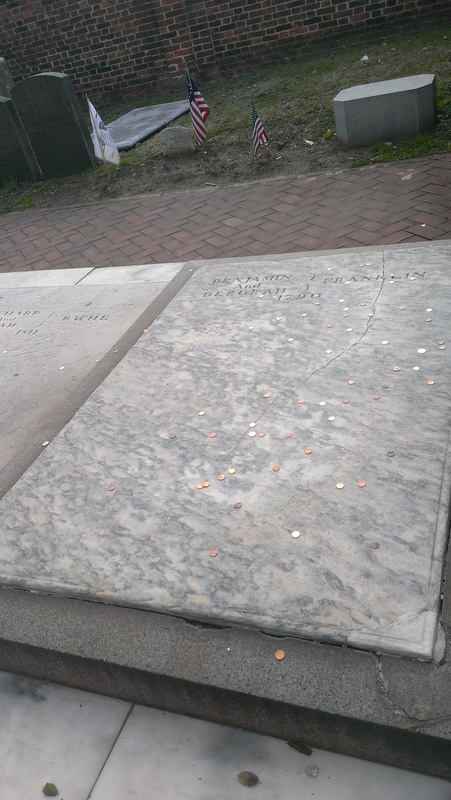 It’s a little hard to tell what this is, but it’s actually Benjamin Franklin’s grave. I didn’t even know he was buried in Philly! 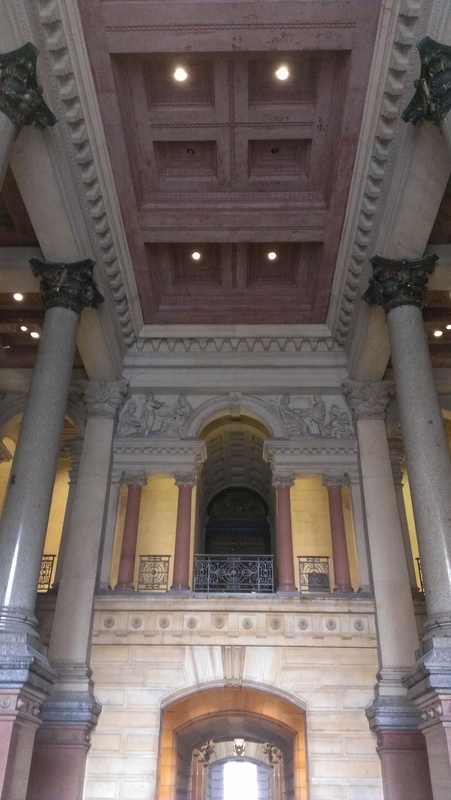 Philadelphia’s city hall is a gorgeous building. Definitely one of those buildings you want to be sure to look UP in. 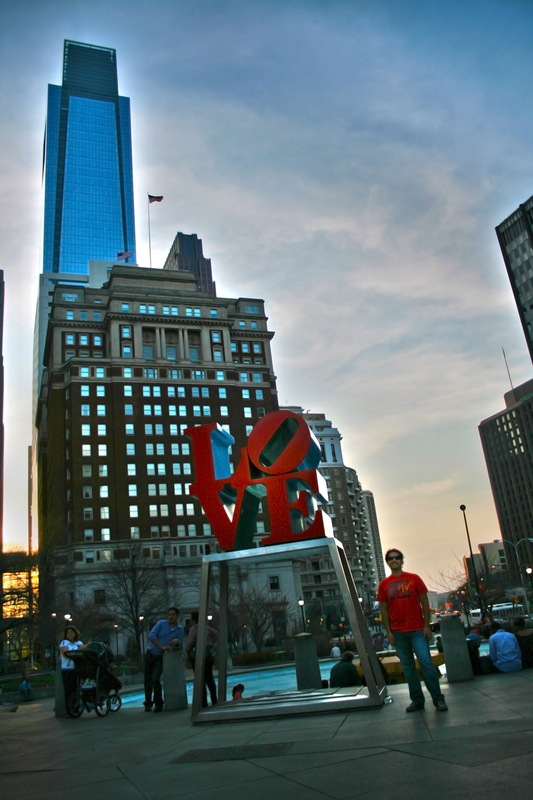 Did you know it was the tallest building in Philadelphia until 1987? 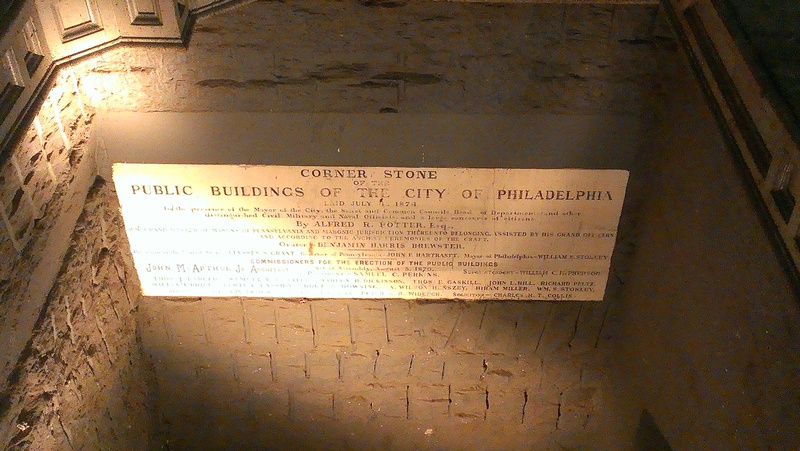 I love the fact that the cornerstone of city hall is called out like this. 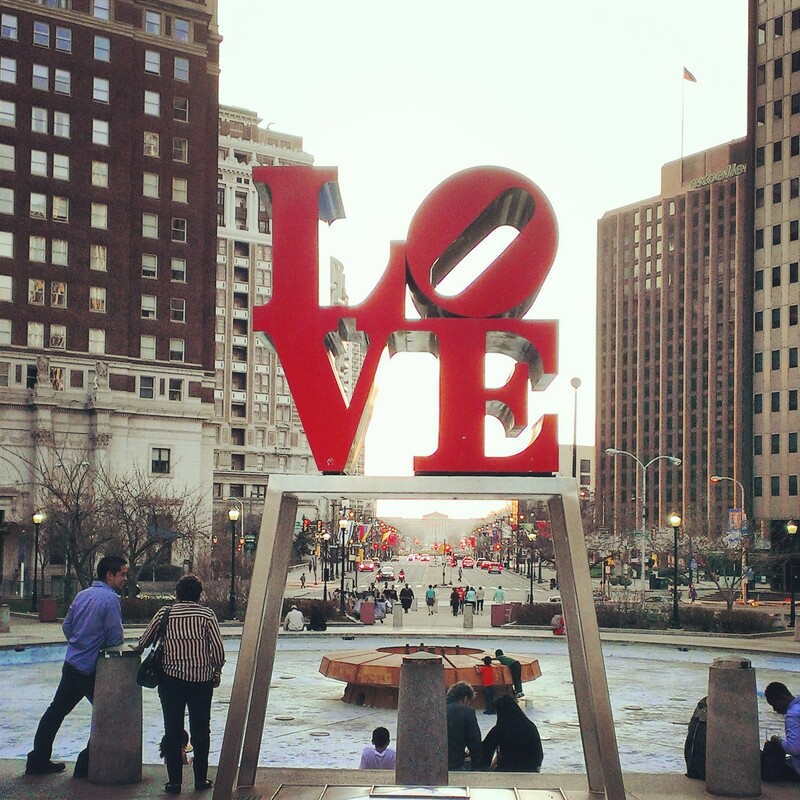 The well-known Love sculpture in LOVE Park (although the official name is JFK Plaza). Like the Liberty Ball, for some reason I expected this sculpture to be bigger! It’s still really cool though. Thank you Jason for getting this cool picture of me with the sculpture! Jason is a photographer and designer, so check out his site for more of his work! Although I don’t think much of Comcast as a company (terrible customer service and prices! 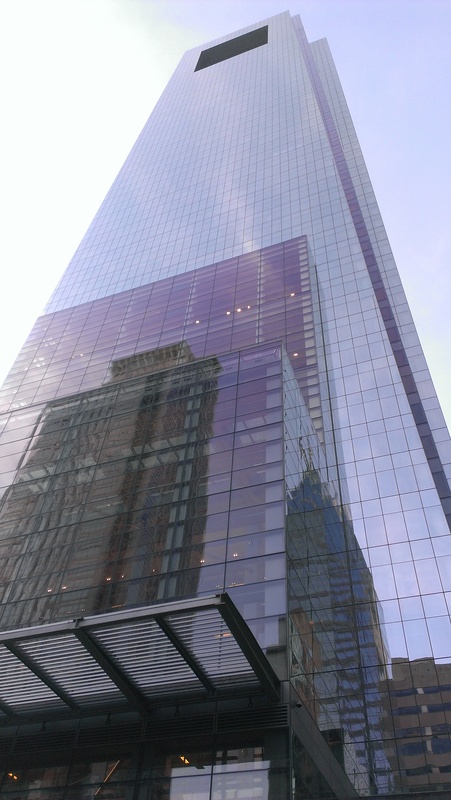 ), the Comcast Center is a pretty cool-looking building. And that was my whirlwind tour of the city! We did a LOT of walking around to see all these sites and that was a lot of fun. 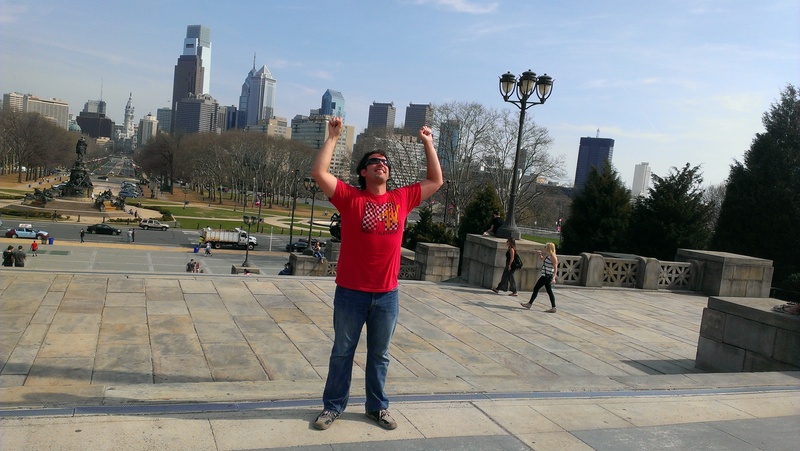 After we finished at Comcast Center, I got a bit of a driving tour, where I saw things like the Manayunk Wall and Boathouse Row. Afterwards, we drove back to the city to have a drink at Woody’s, a bar in the Gayborhood (which is actually part of Washington Square West). I was happy that Jason’s friend Joey, who I met in London last November, was able to join us there with his partner. What a great day! Although I was in the city until today, Sunday was the only day where I really got out to see and do anything. Some of my coworkers (there was a group of us there to facilitate some training) went into the city on Tuesday afternoon, but the weather was chillier and intermittently rainy (sometimes pouring! ), so I opted out of that adventure. Still, I had a fun week training with them and hanging out in the evenings. I’m home now for the next six weeks or so until my next trip, which is to the Los Angeles area of California in early June (another work trip). I’ll have more to write about before then though! I keep teasing my next trip to Europe in my posts, so I promise you’ll see a post on that very soon. Having a local serve as a personal tour guide is my favorite way to see a city. Very fun! I appreciate you sharing your tour with us via your photos. I know it takes time to create a visual post like this – so thank you for your efforts! Jason’s photo of you with the LOVE sculpture is fantastic. Wow. Another terrific travel summary. I love experiencing these cities vicariously – thank you for that! Ben Franklin’s grave is in a cemetery at Christ Church, but it’s a long flat tombstone and the carving on it is kind of hard to read. Thankfully there’s a big sign on the cemetery fence so people know which grave it is.